Today we will discuss about types of gearbox used to power transmission in automobile industries. An automobile requires high torque when climbing hills and when starting, even though they are performed at low speeds. On other hand, when running at high speeds on level roads, high torque is not required because of momentum. So requirement of a device is occur, which can change the vehicle’s torque and its speed according to road condition or when the driver need. This device is known as gearbox box. In this type of transmission different speed ratio or gear ratio is selected by the driver manually. Some special skill of driving is required to operate this type of gear box. According to their design, this is subdivided into three types. When we talk about types of gearbox, this is one of the oldest type. It this, gears on the main shaft are moved right or left for meshing them with appropriate gears on the counter shaft for obtaining different speed. This type of gear box derives its name from the fact that the gears are meshed by sliding. One disadvantage of it is that, special skill is required to operate this gear box and there are high chances of wear and tear of gearbox. This is one of the famous type used in twenty century. It this gearbox, all the gears are in constant mesh with each other all the time. The gears on the main shaft rotates freely without rotating the main shaft. 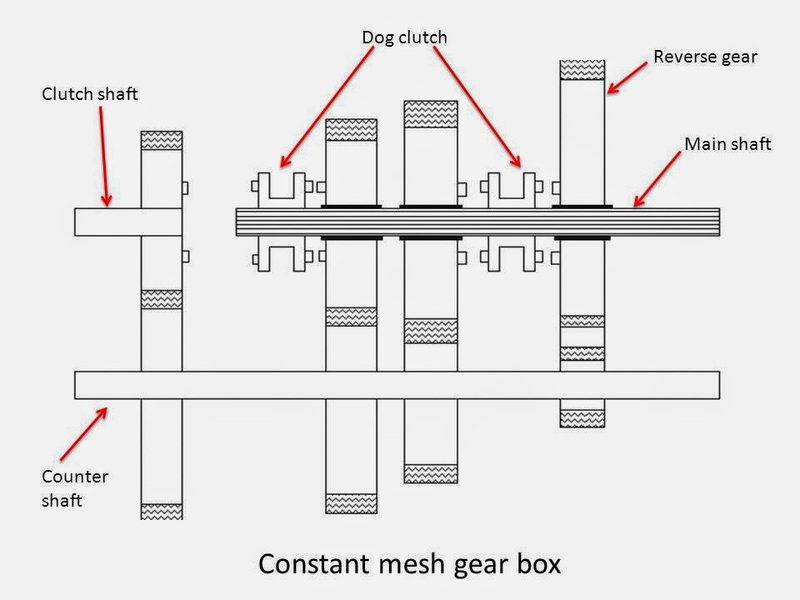 Constant mesh gear box consists two dog clutches. These clutches are provided on the main shaft, one between the clutch gear and the second gear and the other between the first gear and reverse gear. When the left side dog clutch is made to slide left by means of gearshift lever, it meshes with the clutch gear and the vehicle runs on top speed. If this clutch slide right and mesh with second gear, then the vehicle runs on second gear speed. So in constant mesh gear box we can change the gear ratio by shifting the dog clutch. 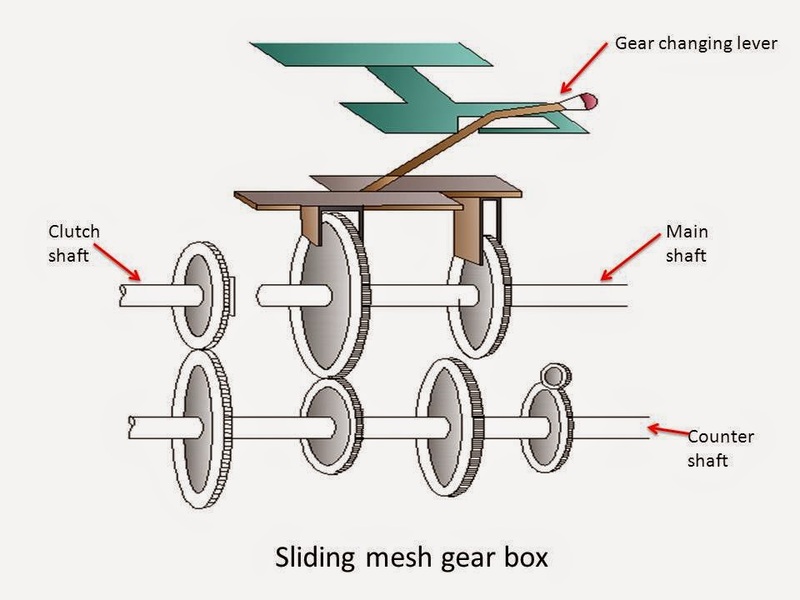 This type of gear box is more popular than sliding mesh because it creates low noise and less wear of gears. One big problem occur in constant mesh gear box is that when the driver engage the dog clutch, the main shaft and gear to be meshed running at different speed. So when engage this gear cause wear and tear of dog clutch. This problem is solved by a synchromesh gear box. This gear box is same as the constant mesh gear box except dog clutch is replaced by synchromesh devices. 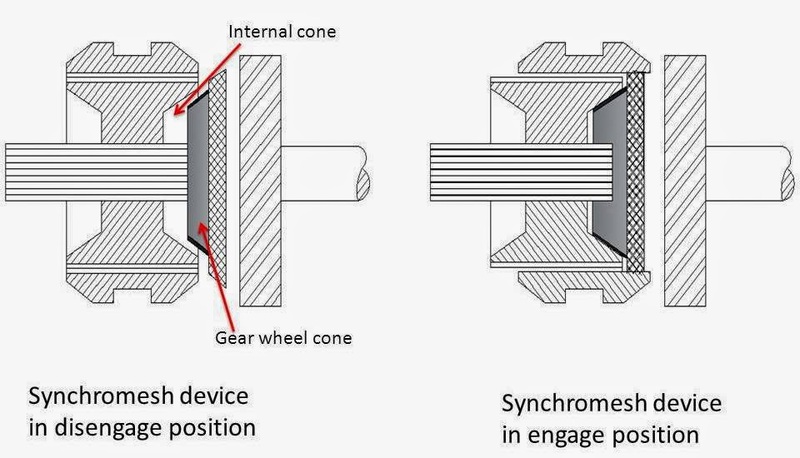 Synchromesh gear devices works on the principle that two gears to be engaged are first brought into frictional contact which equalizes their speed after which they are engaged readily and smoothly. The synchromesh looks like as the cone clutch where the outer surface of cone consist the frictional surface. This type of gear box is widely used in automobile. When we talk about transmission, the automatic transmission is unforgettable. A transmission in which various speeds are obtained automatically is known as automatic transmission. In this type of gear box driver merely selects the general car condition such as forward or reverse. The selection, timing and engagement of gear for the required gear speed are accomplished automatically when the accelerator is pressed or depressed. Automatic transmission needs no gear change lever and clutch pedal since clutch and transmission is a combined unit and works automatically. This type of gear box uses no sliding dogs or gears to engage but different gear speeds are obtained by merely tightening brake bands on gear drum. It consists of a ring gear annular wheel, sun gear and planet gears with carrier. 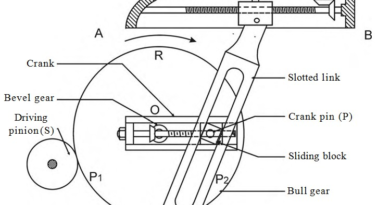 In order to obtain different speeds any one of these units can be held from rotation by means of brake band. The ring gear contains teeth on it inner circumference and it surrounded by a brake band. The brake band is operated by a gear stick or lever to grip the ring gear and hold its movement. The sun gear is attached to the clutch shaft thus moves along with the movement of engine crankshaft. 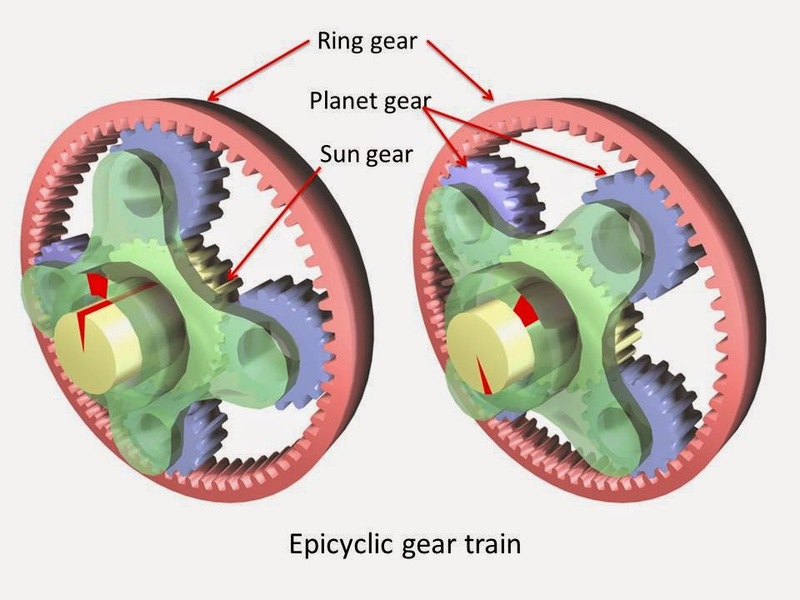 The planet gears are in constant mesh with both the sun gear and ring gear and are free to rotate on their axes carried by the carrier frame which in turn is connected to the driver shaft. When the ring gear is locked by the brake band, the rotating sun gear causes the planet gears to rotate. Since the ring gear cannot move. The planet gears are forced to climb over it. During this position, the ring gear acts as track for the planet gears to move over. The driven shaft which is connected to the planet gear carrier is thus rotate. When the ring gear is released, it is free to move in consequence to the rotation of planet gears which rotate around their axis. During this position, there is no movement of planet carries and hence the driven shaft remains stationary. A planetary gear box contains a numbers of such units to obtain various speed reductions. Hydraulic torque converter is same as the electric transformer. The main purpose of the torque converter is to engage the driving member to driven member and increase the torque of driven member. In the torque converter, an impeller is bolted on the driving member, a turbine is bolted on the driven member and stationary guide vanes are placed between these two members. This all parts are enclosed into single housing filled with hydraulic liquid. The impeller rotates with the driven member and it through the liquid outward by centrifugal action. This liquid flowing from the impeller to turbine runner exerts a torque on the stationary guide vanes which change the direction of liquid, thereby making possible the transformation of torque and speed. The difference of torque between impeller and turbine depends upon these stationary guide vanes. This serves as the function of both gear box and clutch. Today we have discussed main types of Gearbox used in automobile. If you have any query regarding this article, ask by commenting. If you like this article, don’t forget to share it on social networks. Subscribe our website for more informative articles. How is gear shifting done in planetry gearbox? How to work a synchromesh device? Ekdam mast samjhye hai……all doubt clears….